TO ENTER: Send an email to Dody Rogers at scvdody@earthlink.net or phone 661 252-7639 and give: Artist name and phone no and email. Confirm you have read the requirements of the show below. Tell me if you want 1 or 2 club panels for 4 or 5 pieces of art OR if you have your own racks or panels for a larger display. Approximately 10 x 10 area. ENTRIES must be in by April 20 to be eligible. Space is limited to 45 artists only so enter early. DESCRIPTION AND ELIGIBILITY Set up will be between 8:00 and 10:am. The show is from 10:00am and 4:00pm. You will be given a space or panels and a map before the event by email. Entries are first come first served and spaces will be randomly drawn. Artists may trade with another artist if it is mutually agreed. Artists must be paid members of SCAA. Artists must stay the whole day with their art or arrange for someone else to be there to represent the artist. Customers want to meet the artists. SPECIFICATIONS OF ART Artist's work must be the original design and creation of the artist. All art must be professionally displayed. Prints and greeting cards will be allowed. Price tags will be made by the individual artists. Business cards and bios. are encouraged. Demonstrations are also encouraged. All media is accepted. REQUIREMENTS OF DISPLAY We will have club panels (2 per artist) for those that have 4 or 5 pieces of art and we will have arranged spaces about 10 x 10 for larger displays with easels or racks for up to 10 to 12 works plus cards or prints. You may also have a table or easels in the 10 x 10 spaces. No umbrellas or canopies as the site has lots of trees and is very shady. Small TV size trays may be used by the club panels. Chairs will be provided by the restaurant. We will need clear space around panels to walk completely around them. All boxes and carts should be stored in your car during the show. FEES AND SALES Entry fee will be $25 per artist and will be collected the day of the event. All sales will be handled by the club and will be subject to a 25% commission to be paid to SCAA. 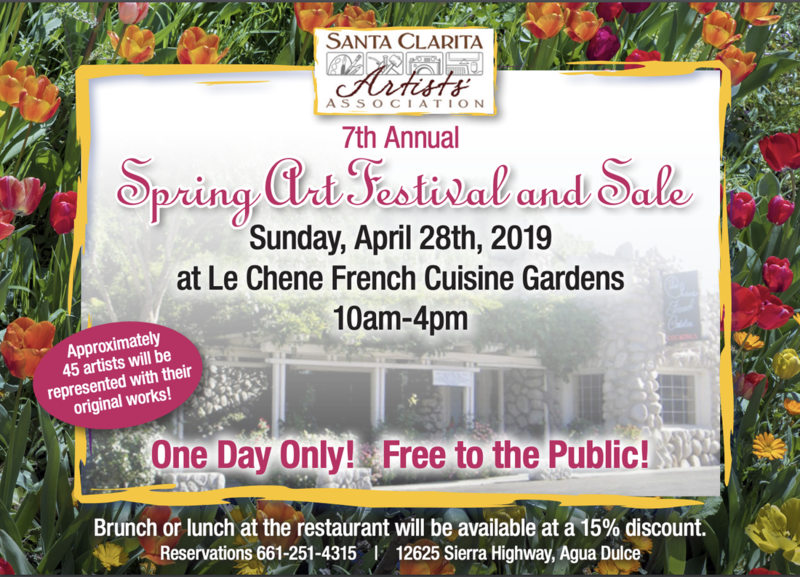 INVITE YOU FRIENDS AND PAST CUSTOMERS All members are encouraged to attend, bring guests, have brunch or lunch, and enjoy the art. Reservations for dining are recommended. Call Le Chene at 661 251-7638. Press releases and ads will be in local newspapers and magazines and social media. The restaurant will also have an outdoor wine bar. Event postcards are ready and will be at club meetings and the Newhall gallery for your use. See attached postcard with this eblast. Entry deadline: By midnight, April 20, 2019.